“Holy Baptism is full initiation by water and the Holy Spirit into Christ’s Body the Church. The bond which God establishes in Baptism is indissoluble.” (Book of Common Prayer, p. 298). Baptism is one of the primary sacraments of the Church. It is so foundational to our faith that the baptismal font is what is first seen as we enter our church and as we leave to return to the world.We believe Holy Baptism, by water and the Holy Spirit, to be the outward sign by which we are initiated into Christ’s Body, the Church. Baptism is open to all who seek a deeper life in Christ. 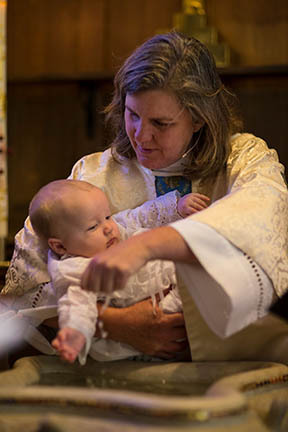 The Episcopal Church welcomes any, regardless of age, to receive the sacrament of Baptism. The sacrament of Holy Baptism is celebrated on the four baptismal feast days in the church year: the Sunday after Epiphany (early January); the Easter Vigil (the Saturday night before Easter); Pentecost (in late May/early June); and the Sunday after All Saints Day (early November).